Tender Thai spiced beef, cooked on the grill until smoky, juicy and pack with flavor. The Thai marinade makes the steak a little sweet and a little spicy, perfect for the outdoor grill. 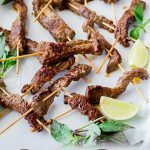 These Fragrant Thai Beef Skewers with Hot & Sour Dressing are a great summer recipe and one you’ll come back to again and again. The sun had long since set in a riot of oranges and reds, but the evening was balmy and filled with the sweet fragrance of summer flowers and the bitter sweet scent of the open grill. All across the patio your family are grouped, chatting, laughing and just being together in a way only family can. Relaxing back on the brightly coloured bean bags that are scattered like confetti, decorating the new outdoor space. Your heart smiles, after 3 long years and a lot of hard work, you are finally home. You feel the warmth of contentment and a realisation that life doesn’t get better than family, friends and food. 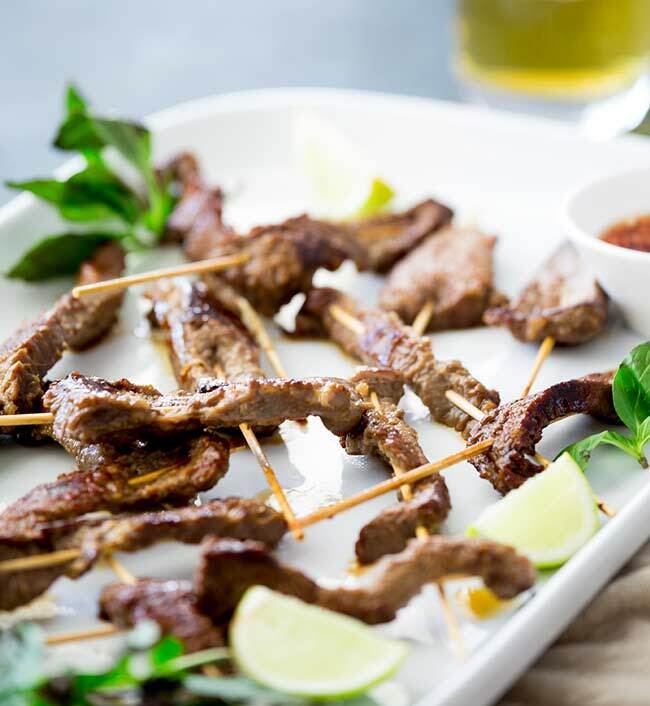 As another beer is opened the Thai beef skewers hit the grill and you are instantly transported back to the streets of Phuket, smoky streets filled with food carts as tuk-tuks flying past. Oh Thailand with the amazing food and beautiful scenery; your wanderlust starts to take hold but as your mouth starts to water and you look around you decide that in this moment there is nowhere in the world you would rather be. Skirt steak is a wonderful cut of beef. If prepared correctly it can be super tender. Like all beef you are best to cut it across the grain. Skirt steak comes as a very long piece so I find it best to cut it into 4 chunks and then cut the chunks across the grain. 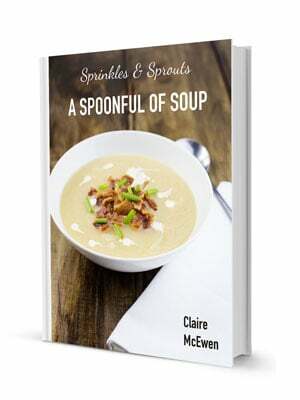 This ensures that you cut through the fibres so each mouthful is melt in the mouth tender. Skirt steak doesn’t need long to cook, it is best to cook it hot and fast. Get the grill seriously hot and flash the beef skewers on there. They will take 2 minutes max to cook. To make the hot and sour sauce you will need plenty of lime juice. Please use fresh limes, the difference is amazing and your dipping sauce will taste fresher and just fabulous. If you don’t want to make the dipping sauce or aren’t a fan of the sour nature, then use a sweet thai chilli sauce. It won’t be the same but it will still be good! Tender Thai beef, cooked on the grill until smoky, juicy and pack with flavor. 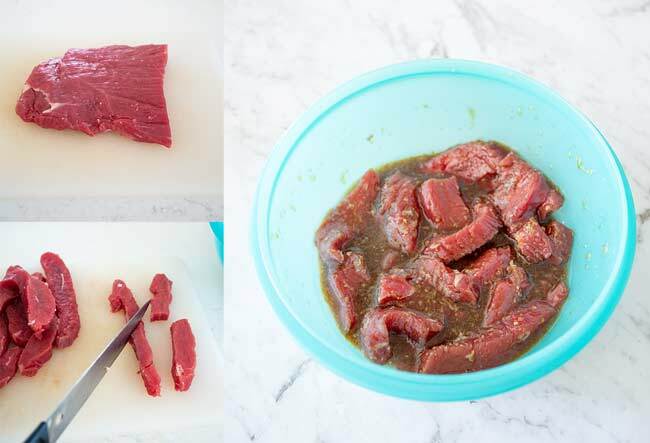 The Thai marinade makes the steak a little sweet and a little spicy, perfect for the outdoor grill. 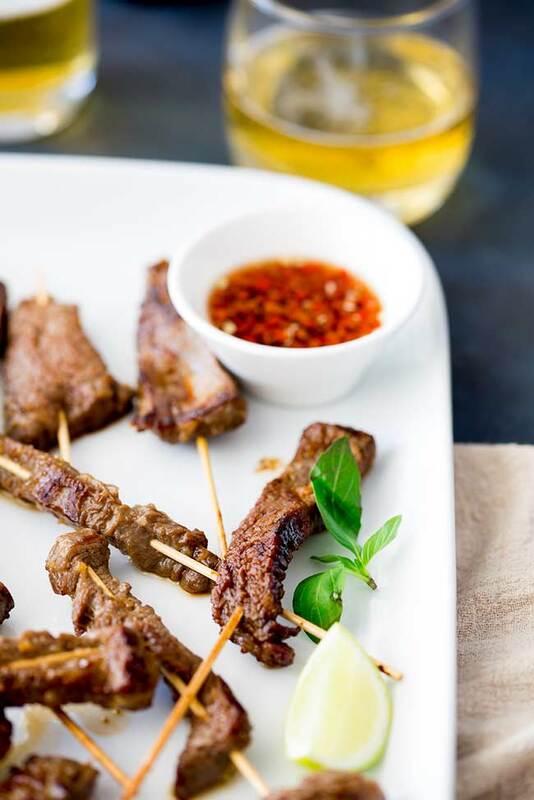 These Fragrant Thai Beef Skewers with Hot & Sour Dressing are a great summer recipe and one you'll come back to again and again. Place the marinade ingredients in the food processor and whizz until you have a chunky paste. Mix the steak and the marinade together and place in the fridge for 4 hours. When you are ready to cook get the grill super hot and whilst it is heating up thread a strip of beef onto each bamboo skewers. Grill the beef skewers over a high heat for 1 minute on each side. Serve with the dipping sauce. Mix all the ingredients together until the sugar has dissolved. 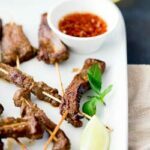 If you love food why not subscribe to my newsletter, I will drop you an email every now and then, just to say hi and send you a couple of recipes think you might love, like these Fragrant Thai Beef Skewers with Hot & Sour Dressing. I am in love with that Thai dipping sauce. This recipe has me drooling. It’s def my kind of flavors. I really do like cooking with skirt steak, it can be so nice and tender if done right!